ICAI has taken CA IPCC November 2017 Examination. The Business Laws, Ethics & Communications Question Paper also one of the subjects of IPCC course. The intermediate students can download this Law Question Paper in pdf from here. 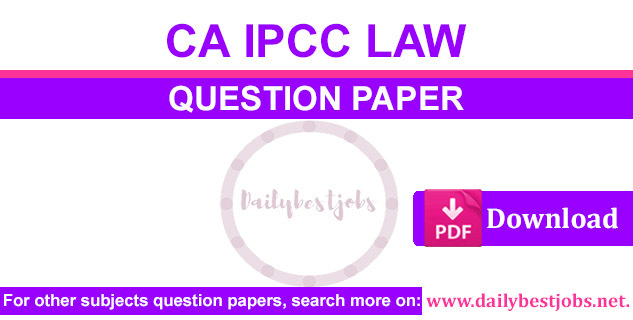 Now, you can download IPCC Law Question Paper November 2017 from the below link and share with your friends. CA IPCC Business Laws, Ethics & Communications Question Paper Nov 2017 pdf download link is below available. We added here all subjects IPCC November Question Papers 2017. You can search on our site whatever are you looking for or Subscribe your Email ID to receive free latest notifications. Now, Download below PDF file of CA IPCC Business Laws, Ethics & Communications November Question Paper 2017. Hope you can able to download IPCC Law Question Paper November 2017. You can also download more related to CA IPCC, CA Final or CA CPT free resources such as ICAI Practice Manual, Certified Copies, question papers with solutions & important notes.